The columnar building, to her left, in the background, represents the United States Government. It was the summer of 1938. Harry and Flora Ness' first child was going to be married. The family traveled by bus from their home in the East New York section of Brooklyn to Washington, D.C., where their son had been living, so that they could meet his fiancée for the first time. More than thirty years earlier, both Harry and Flora, who were both single and teenagers at the time, had managed to emigrate from Russian Poland, leaving the only home they had ever known, escaping a life that could only promise them a future of daily persecution and a poor standard of living. They probably envisioned for themselves and the family they hoped to have, a better life in the United States. They wished for a life free from discrimination, with liberty and greater opportunities to improve their lot in life. Many of their kin had emigrated before them, but some of their loved ones, for one reason or the other, stayed behind, unaware of or unfazed enough to think the tragedy would reach them, yet these tragic events that would occur to their families and so many others during World War II, affected them in one way or the other. Harry and Flora never discussed their lives they had led in Eastern Europe with their family, nor did they ever talk about the families they left behind. Surely they had kept up with the goings-on back in Poland by reading Jewish newspapers such as the Forward and learned about the horrible events that were occurring there at the time. They probably felt a sense of helplessness, knowing that they could do nothing to stop what was happening. 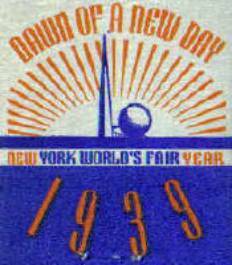 In 1939, American business put together this World’s Fair in Flushing Meadows Park in Queens, New York. The theme was “Building the World of Tomorrow.” Still during the time of the Depression, they introduced new materials and technologies, e.g. the television. They tried to give all Americans a dreamy glimpse of what the future would be, even though the future would soon include a world engulfed in another war. Was it the "dawn of a new day"? In February 1939, Flora took her Oath of Allegiance and became a United States citizen. What a proud day that must of been for her. She was thankful that she had emigrated from her home and Poland, but her departure was bittersweet because she had to leave her mother and four brothers behind. Three of her brothers would eventually immigrate to the United States before the war. On September 17 of the same year, a short time after my grandmother visited the World’s Fair, Germany invaded Poland. Just ten days later, the Polish Army surrendered. Thousands upon thousands of Polish Jews fled to the Russian zone, as Russia and Germany had divided Poland once again. Warsaw, once home to more than 350,000 Jews, fell. Over one-third of Polish Jewish soldiers were killed, and the remainder were captured, with a similar fate awaiting them in captivity. The following spring, Jews were forced into “ghettos,” separated out from the general population. Of the 3.3 million Jews living in Poland, only one in eleven would survive. On July 10, 1941, in the town of Jedwabne, Poland, home to 1,600 Jews, including my grandmother’s mother Sheina Gitel and her only son Zalman and whatever family he might have had, most likely perished in the pogrom there, as did most all their fellow Jews.